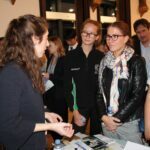 Sydenham High’s first Medical Focus careers evening attracted an audience of over 120 students eager to learn about potential roles in medicine and allied medical fields. Students from Sydenham High were joined by delegates from Dulwich College, Streatham & Clapham High and Sydenham Girls’ School to network informally with more than a dozen experts from different medical specialisms and find out more about these specific career paths. The experts included: a GP registrar, a vet, a specialist in clinical radiology, a radiographer, a midwife, a chiropractor, a paediatric research nurse, a consultant periodontist, a dental hygienist and a speech therapist. 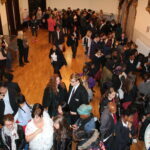 The event was part of the school’s Medical Focus Programme. This offers lectures, talks and help with preparation for university applications from reading lists to interview practice supported by workshops run by the Drama department, as well as BMAT and UKCAT exam preparation. 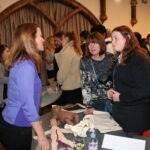 "Medicine, Dentistry and Veterinary Sciences are rewarding and exciting career choices, but places at university to study one of these disciplines are becoming increasingly competitive"
Each week students in year 9-13 attend the Medical Society which supports their interest in medicine and related careers as well as helping them to navigate their way through the application process. the society also provides a platform where students can share ideas and concerns around challenging medical topics and hone some of the key skills required to work in medicine.